Posted by Jenny in Meteorology, nature. 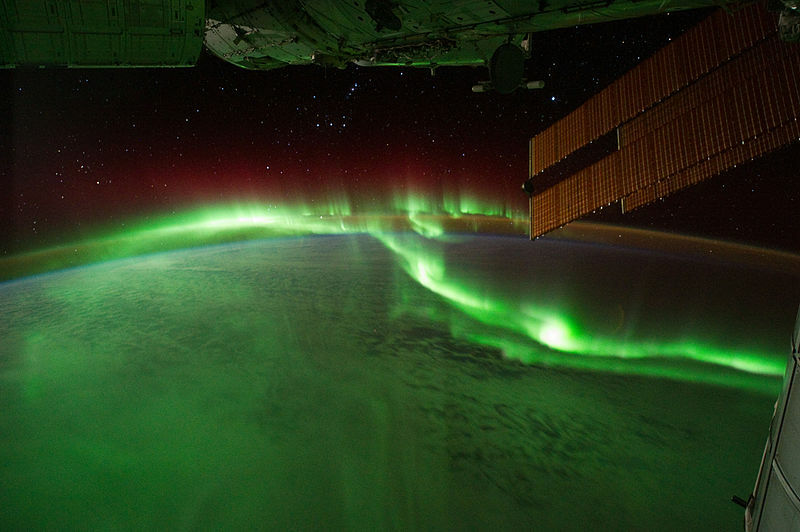 Aurora Australis seen from the International Space Station. Auroras happen when ions in the solar wind collide with atoms of oxygen and nitrogen in the upper atmosphere. The atoms are excited by these collisions, and they typically emit light as they return to their original energy level…. 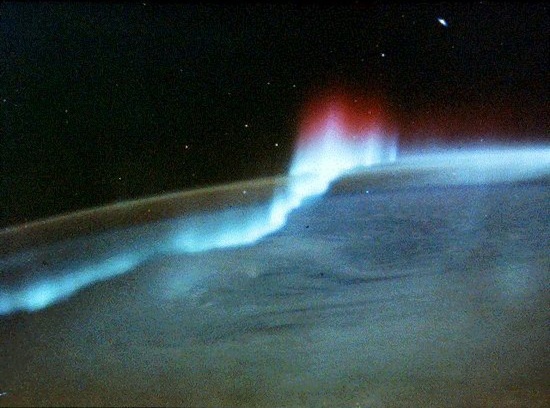 Auroras are a spectacular sign that our planet is electrically and magnetically connected to the Sun…. The pressure and magnetic energy of the solar plasma stretches and twists the magnetic field of Earth like rubber bands, particularly in the tail on the night side. This energizes the particles trapped in our magnetic field; that energy is released suddenly as the field lines snap the particles down the field lines toward the north and south magnetic poles. —Captions to photos written by the ISS Expedition 23 crew and Michael Carlowicz. 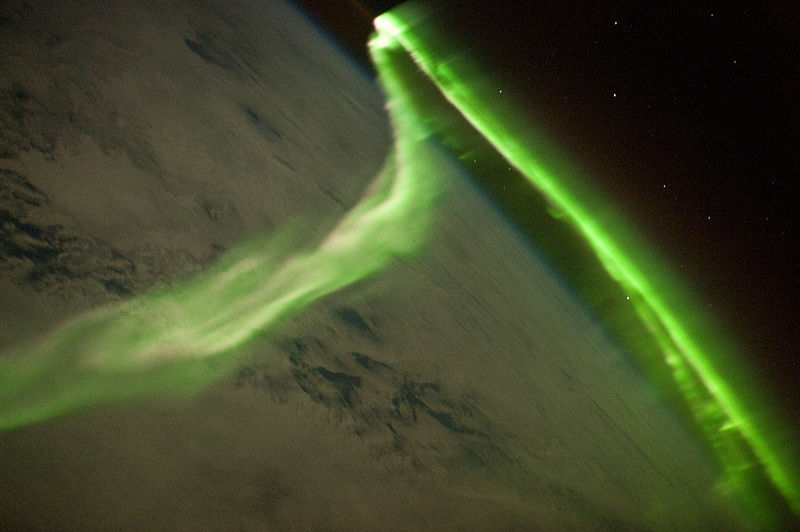 Poets have tried to capture the magic and mystery of the Northern and Southern Lights. It’s one of those topics that’s too dazzling to write about. The helpless poet is reduced to shopworn adjectives of grandiosity that fall far short of the subject. Herman Melville, for instance, wrote a clunker of a poem on the topic even though he was a great writer. The description quoted from above included few lines from a poem by Robert Service titled “Ballad of the Northern Lights”: And the skies of the night were alive with light, with a throbbing, thrilling flame; Amber and rose and violet, opal and gold it came. It swept the sky like a giant scythe, it quivered back to a wedge; Argently bright, it cleft the night with a wavy golden edge. That’s pretty good. The trick to the poem is that it’s about an exhausted, ruined man come back from the Alaska goldfields. He has no gold in his pockets, only the memory of the wavering gold of the Northern Lights. He and his two pals were “the discards of the pack,” and “the gold lust crazed us all.” He tells his story to a stranger as he waits outside a saloon, begging for a handout. His bitter story gives a bite to his description of the wonders of the sky, and leaves me to think about how gazing at the sky can offer the deepest answers by way of the dazzling realities that dwell just over our heads. The Lady of Shop Creek and Ronnie McGaha. Photo by Clyde Austin. The photo above was taken about eight years ago. 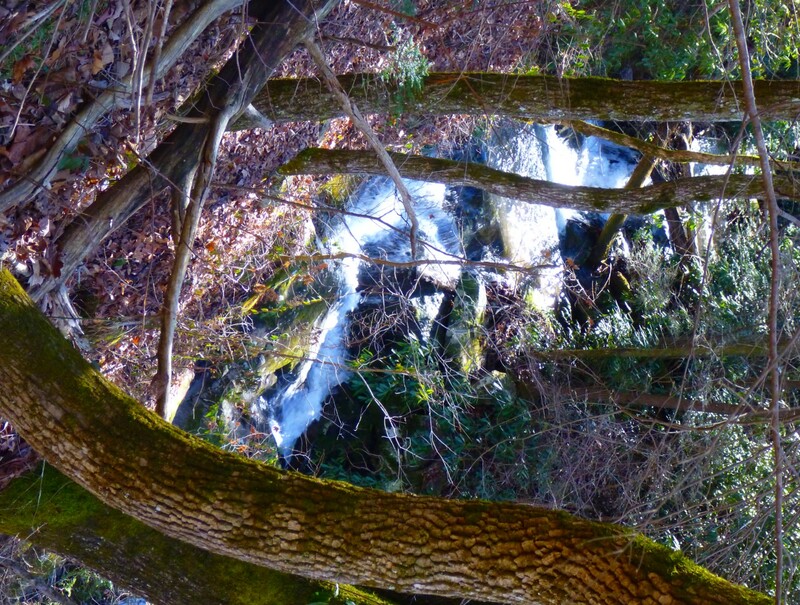 You can see why many people over the years have made the pilgrimage to admire the Lady of Shop Creek. There she is, not ashamed a bit about being naked, hands on her hips, looking a tad disdainful. I think she’s waiting for someone to offer her a martini. Surely she smokes a cigarette in a long cigarette holder. Sadly, the Lady, also known as X-Ray Betty, is ailing. 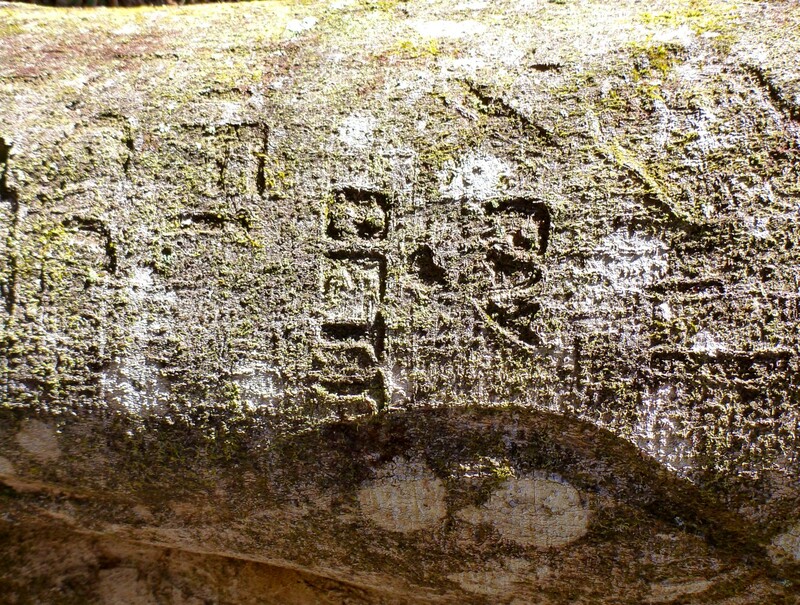 In recent years, the beech tree she’s carved on has filled out. Her face is virtually invisible. Here’s what she looked like on a trip our group took on the 22nd. She has lost face, so to speak. You can still make out her arms and hips. 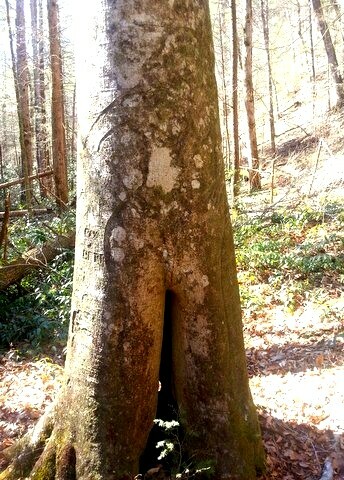 You can still see how the unknown artist started out with the, let us say, crotch of the tree and turned it into another kind of crotch. But after all these years—no one seems to know just how long she’s been around—she is fading fast. Photo by Terri Cox—slightly different angle. Still, we had an enjoyable outing on a beautiful warm sunny day. 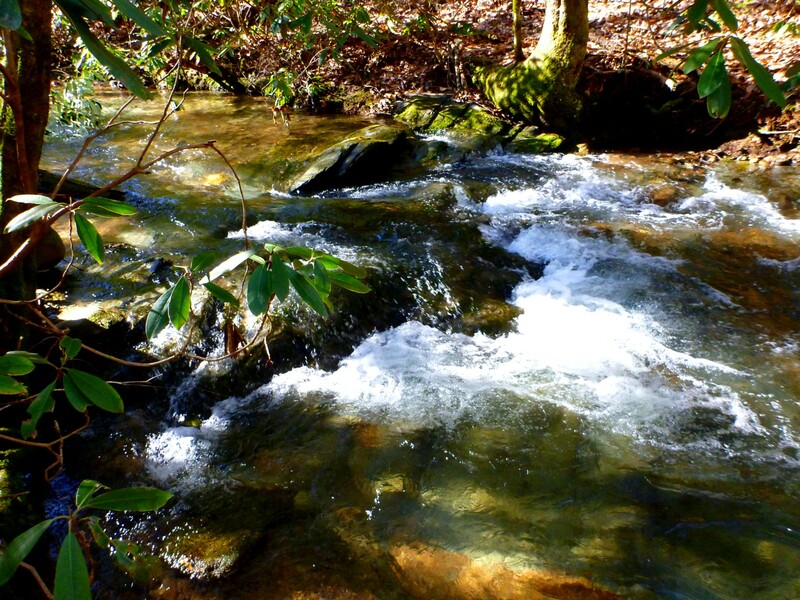 Shop Creek is in the southwest corner of the Great Smoky Mountains National Park. It flows under US 129 into Chilhowee Lake. For me, coming from North Carolina, it means driving through the Dragon—and that comes after a very twisty section of NC 28. But it’s worth it. 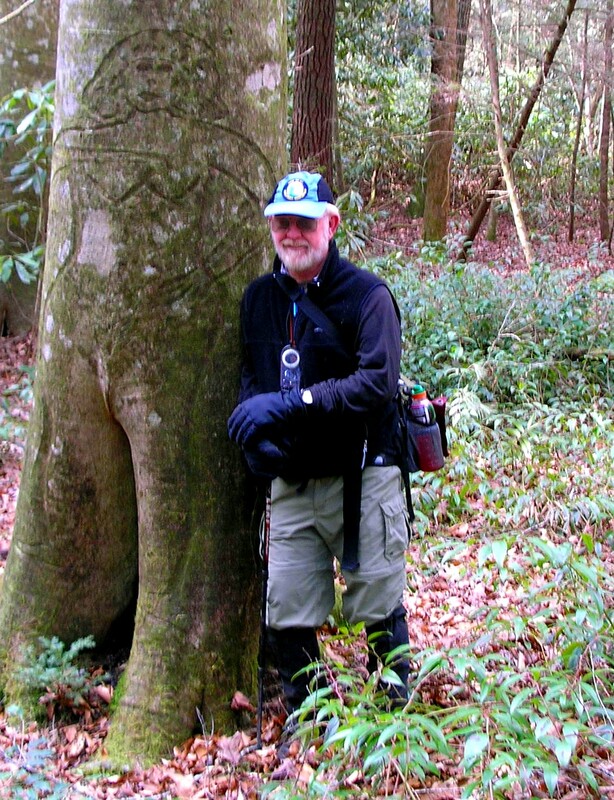 Clyde Austin organized this trip. He’s seen the Lady several times over the years. Our group consisted of Clyde, Ronnie McGaha, Terri Cox, Steve Hixson, Charlie Seehorn, George Grooms, and myself. We parked at a pullout along 129 and climbed up and over a small ridge to avoid awkward going at the very lowest part of the stream. 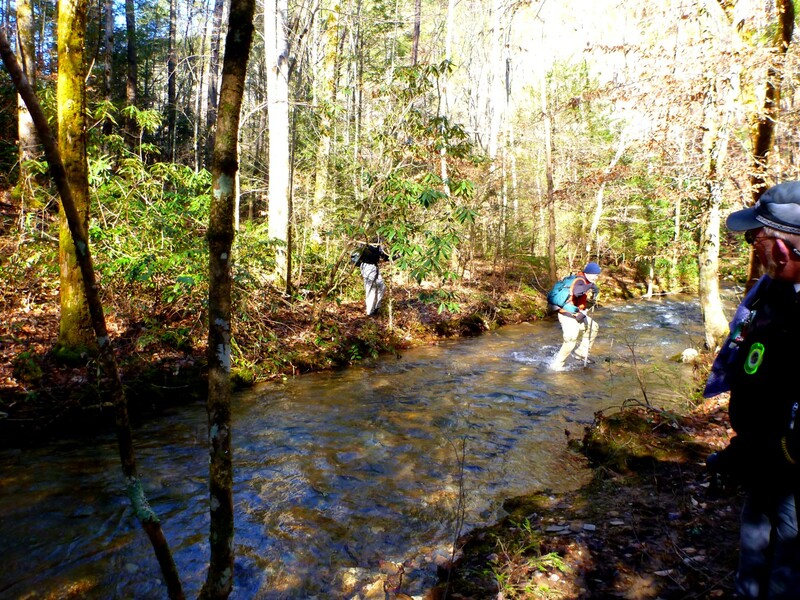 We forded the stream many times, following an old unmaintained manway. One of the many fords of the stream. Clyde and Terri on the old grade. 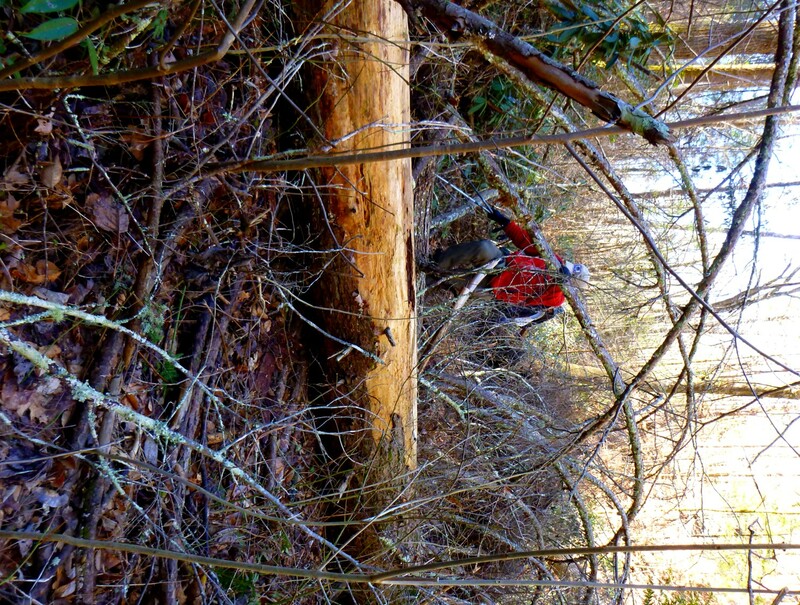 We ran into a patch of blowdown in a place where the valley narrowed down, so we had to just push our way through it. It seems likely the tornado and high wind event of April 27, 2011, brought down some trees here. We also saw a couple of pieces of siding that must have been dropped down by the storm. Clyde wrestles his way through. 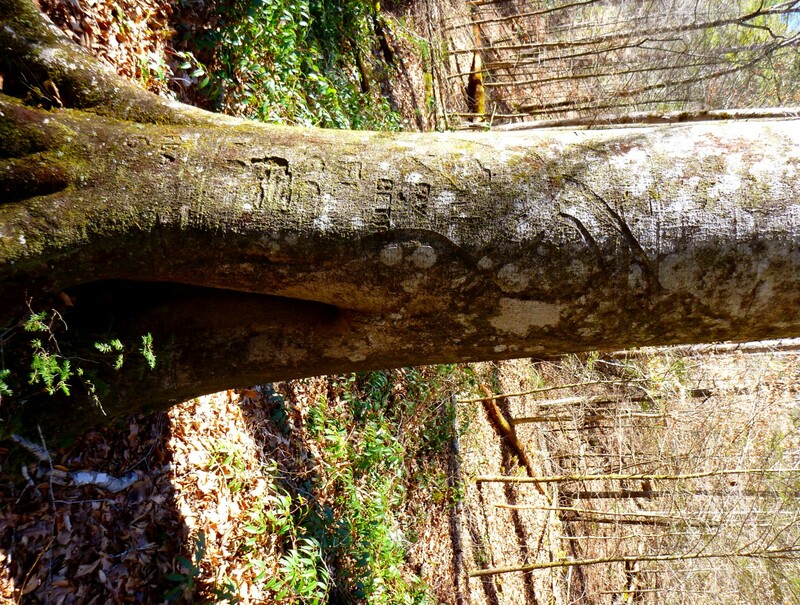 We were looking for the Lady about a mile and a half up, in a flat area on the left side of the stream, on a big beech tree. We knew she faced away from us as we went upstream. Well, we went right by her without seeing her. Soon we realized we’d probably missed her. We decided to keep going. 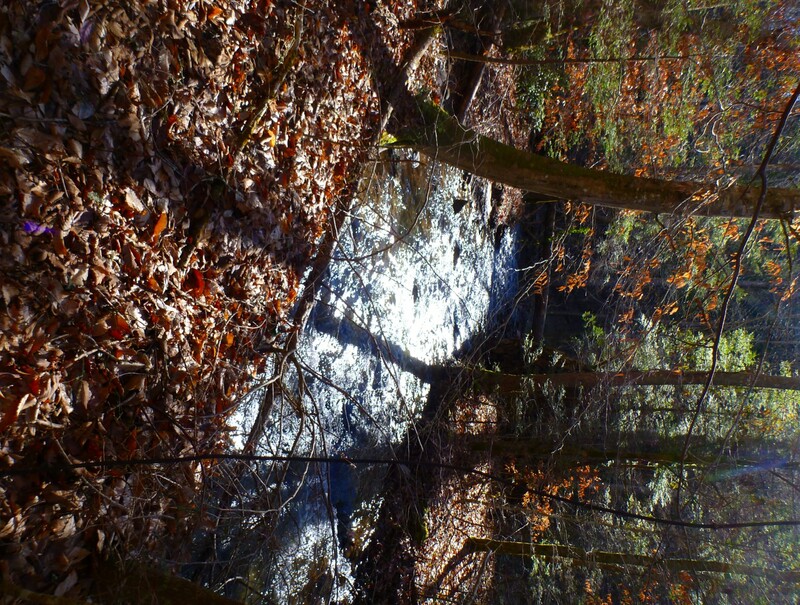 The stream dwindled down to almost nothing. Steve volunteered to run up to Shop Gap just to make sure she wasn’t up ahead—and she wasn’t. After having lunch, we decided to go back and try again to find her instead of staying with our original plan of looping around to Blacksmith Branch. Finally, someone called out: “Found her!” I’d walked past a second time without seeing her. 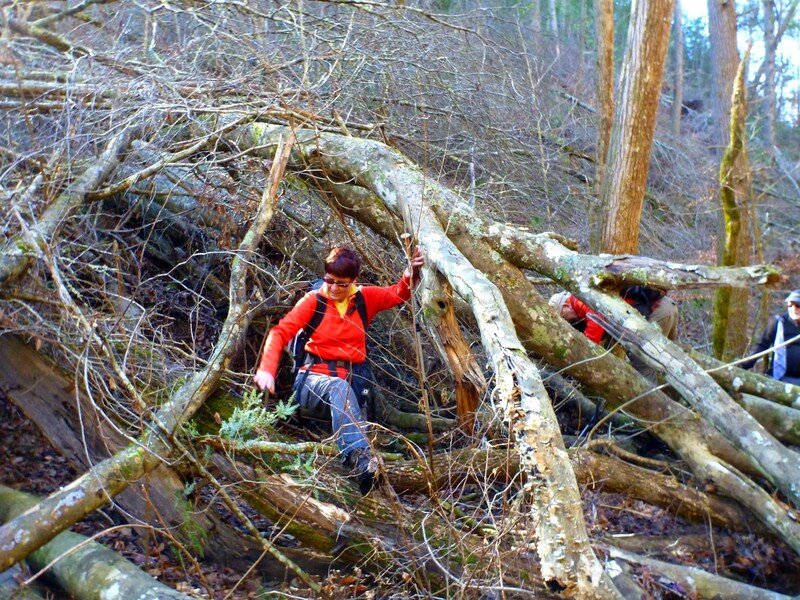 A great day with good hiking companions, but we were sorry to see the Lady not doing so well. Posted by Jenny in history. I’m happy to announce that I have launched my new blog dedicated to topics in history. Called 1870 to 1918, it zeroes in on a period when major world empires swelled to enormous extent only to face cataclysmic changes in World War I.
I chose the Franco-Prussian War and WWI as bookends for the blog, but it will deal with social and cultural topics as well as military history. Followers of Endless Streams and Forests know I’m a bit obsessed with the Boer War, which sits midway through the period. It was while doing my series on the Boers and the British in the Siege of Mafeking that it dawned on me that since I truly enjoy delving into historical subjects, I could take that idea and run with it in a separate blog. 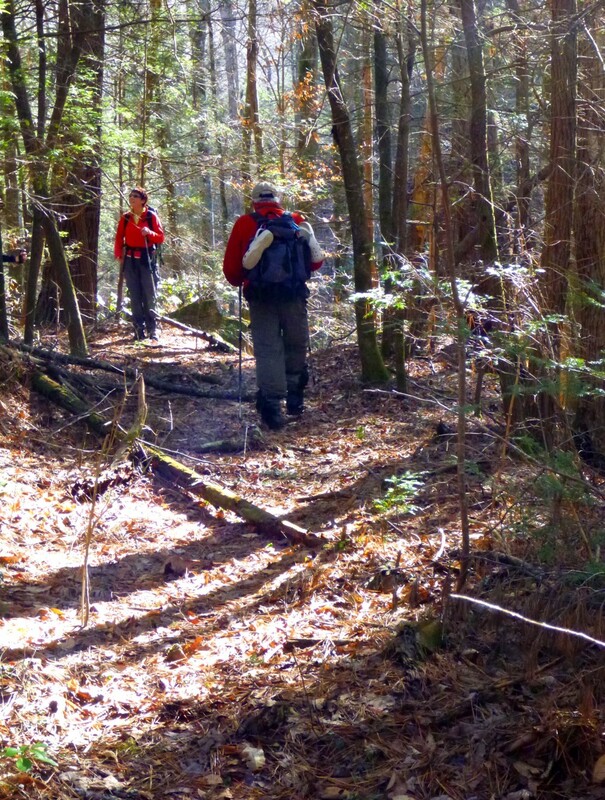 Endless Streams will continue to alternate between hiking topics and other subjects—maybe even some with a historical slant—but the deeper historical pieces will be reserved for 1870 to 1918. I start out with two posts that fall near the beginning and end of my chosen time period. One is about the strange and savage Finnish Civil War of 1918 and the other concerns an oddball event during the Paris Commune of 1871. 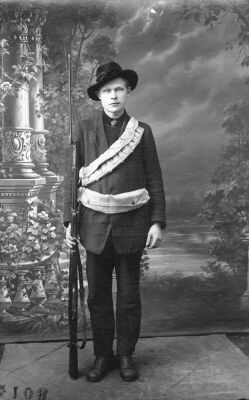 The Finnish war was closely tied in with events of WWI, and the Paris Commune followed from the Franco-Prussian conflict. I hope you’ll enjoy these topics. 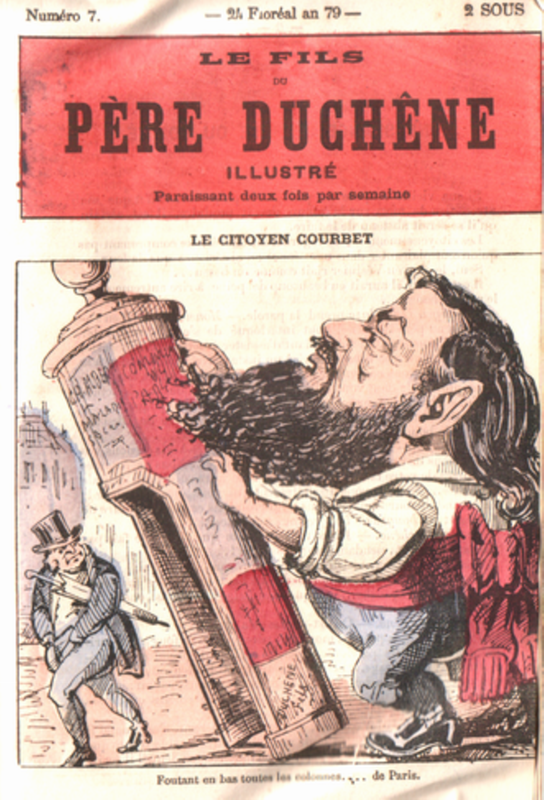 Caricature of Gustave Courbet toppling a “Rambuteau column” (a Paris urinal).